For centuries, the prospect of gazing into the future has captivated anyone with a romantic heart. Humanity has always possessed a desire to know, and our natural curiosity has led us to pursue fortune telling of various forms. Allow us to gaze into the crystal, and reveal what there is to know as we explore the fantastic history of scrying and crystal gazing, otherwise known as crystallomancy. In modern times, we associate scrying with fortunetelling. And the image of a hoary gypsy crone with a crystal ball is etched well into the public consciousness. In the past, the practice of augury, of which scrying and crystal gazing is a part, had a far-ranging set of applications. Too commonly it is associated with revealing future events. In historical accounts, this method of divination was used to not only gain an understanding of the future but also to review events of the past or seek guidance on the present. A crystal-clear vision of the future is a modern construct surrounding the discipline. The act of witnessing images in clear objects, such as crystals or still pools of water, is known as scrying. Most famously, crystal balls have been used for this purpose. In practice, many different objects have been utilized. Besides crystal balls, examples of these objects include still water, mirrors, and other crystals or gems of various shapes. Even polished and oiled fingernails (still on the finger!) have been used. Mediums, mentalists, and seers have long constructed their visions from many sources, including, smoke, fire, flights of birds and other natural portents! Often, the person performing the scrying enters into a trance. Typically, it is self-induced. Others might use aids, such as drugs, to help them attain the correct mindset. Once the trance is entered, the object becomes a locus of concentration. It allows the scryer to banish unwanted thoughts and focus on the matter at hand. It is during this trance that a medium begins to perceive images associated with their scry. The trance, along with the focus object, heightens the perception of the user during this process. Perhaps the earliest known crystal ball use took place in the British Isles. The Romans wrote about how the Druids of the Celts would use balls of polished beryl to divine the future. Written accounts of this practice can be traced back as far as 20 BC. As those familiar with metaphysical healing properties might know, beryl is a gem associated with focus and concentration. This may explain why these orbs were favored by early crystal gazers. The British Museum houses several examples of early globes, designed to be worn or strung on a cord, for use as a pendulum or pendant. Soothsayers in early Rome also employed crystal balls. By the 5th century, the practice was widespread throughout the empire. This eventually led to the early Christian church to denounce the practice. Chalcedonian Christians persecuted these soothsayers as heretics. With interest in the occult rising during the Victorian Era, crystal balls once again grew in popularity. Lovers of ritual, Victorians often used elaborate acts when consulting crystal balls or other fortune-telling objects. Often, a session would start with a Call to charge the ball with psychic energy. This would be a chant, prayer or invocation. Visitors would gather around or pass the crystal ball around while reciting the words provided by their medium. Once complete, the medium would then take possession of the object for consultation. Victorians would expect to witness a mist fill the ball, indicating that it was suitably prepared. From there, the mist would peel back, revealing the image within for viewing. While in a hypnotic state, the seer would then interpret the images displayed within the device for their audience. In the modern era, rock crystal has replaced beryl spheres as the preferred vessel for crystal gazing. Though, in theory, any transparent ball of appropriate quality will do. However, the best crystal balls, no matter the material, require the proper refractive index. The refractive index is a value that measures how light passes through an object. When rated at around two, or just a bit higher, the focus of the object is closest to the surface of the orb, providing a desirable visual effect for objects touching it. Bright spots will form around objects touching the crystal ball. With the enduring fascination surrounding the unknown future, it comes as no surprise that these tools of the trade sometimes rise to prominence. While many examples now reside in museums for public consumption, what follows are some of the more famous crystal balls to grace the pages of history. The Sceptre of Scotland: A crystal ball is housed within this item of royal regalia. Legends attribute former ownership to ancient druids. The orb is constructed of polished rock crystal. The Empress Dowager: Housed in the Pennsylvania Museum of Archaeology and Anthropology. The sphere is of unknown provenance. Received as a gift stories suggest it was once in possession of Empress Dowager Cixi, who ruled over China’s last dynasty. The third largest crystal sphere in the world. 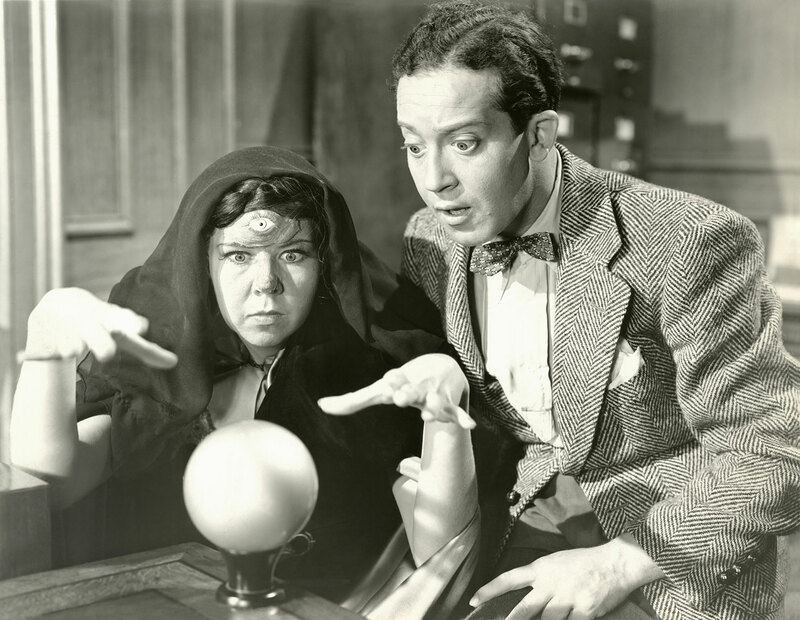 Jeanne Dixon’s Crystal Ball: Dixon rose to fame during the mid-20th century for her predictions, some of which were chillingly accurate. Most notably, she’s alleged to have predicted Kennedy’s assassination. After her death, the scrying tool auctioned for $11,950. The casting of fate and foretelling the future has long been a staple of popular media. 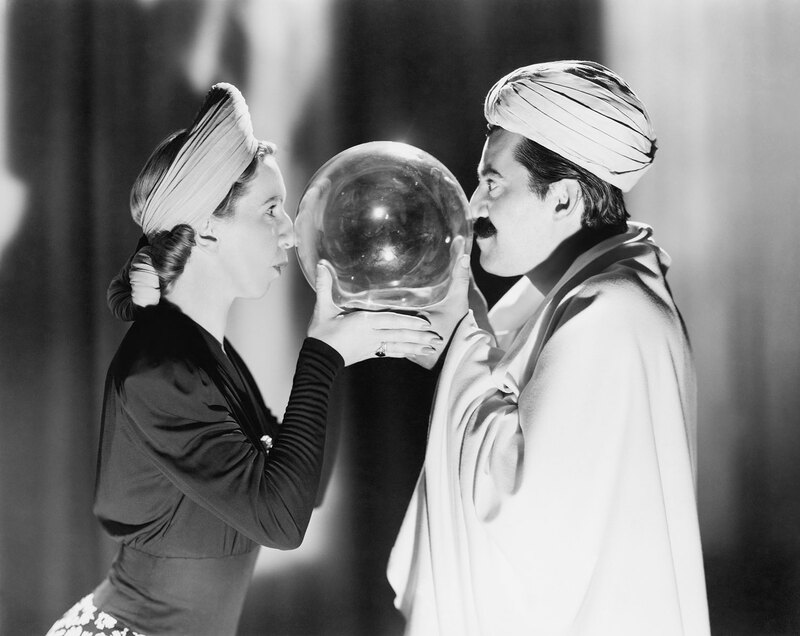 Crystal balls have worked themselves into the fabric of our culture through books, television, and movies. What follows are some of the notable appearances these fortune-telling tools have made over the years. The Lord of the Rings: In the Lord of the Rings trilogy, the palantirs were mystical orbs used by the cultures of Middle Earth to scry on their friends and enemies. The Wizard of Oz: The Wicked Witch of the West utilizes a crystal ball for spying on Dorothy and her friends. Back in Kansas, Professor Marvel also uses a crystal ball of questionable history. Labyrinth: Jareth, the Goblin King, portrayed by the late David Bowie, uses crystal balls frequently as he attempts to enchant Sarah, the heroine. La Bola de Cristal: A youth program hosted by pop star Alaska, airing from 1984 – 1988. Alaska would introduce guests and segments through their crystal ball. Despite the longevity of crystal balls and other tools of divination, no hard scientific evidence yet exists proving that the work. At best, attempts to study the power of scrying have been inconclusive. As with many disciplines considered to be pseudoscience, you interact with them at your peril. Accept this work as an exploration of the fascinating history surrounding crystal balls, scrying, and the other unusual elements related to the world we occupy. It is not an endorsement of these practices, nor a guarantee that they indeed work as described. Discover more about the fascinating world of gems through our Education Center.